As of Monday, we've officially made it halfway through Winter! It was the midpoint between the Winter Solstice in December and the Vernal (Spring) Equinox in March. Hold the happiness, though -- we're still very much in the dead of winter for a couple more weeks, and our next significant snow/ice threat is just around the corner. Tuesday will be mostly quiet. There's a batch of light snow pushing into western New Jersey, but models show it fizzling quickly as it hits our very dry air mass. I do not anticipate any big problems during Tuesday morning's commute, just scattered snow showers driving a few snowflakes through the state. We'll see increasing sunshine through Tuesday afternoon. High temperatures will be seasonable — close to normal for early February — within a few degrees of 40. Tuesday night will be quiet too. Expect partly cloudy skies and chilly temperatures, bottoming out in the upper 20s to around 30 degrees. Our storm system won't start pushing into New Jersey until about mid-morning Wednesday, say around 9 a.m. Yes, I suspect we'll make it through the morning rush hour without any weather trouble. Precipitation will continue through Wednesday night, through as late as 2 a.m.
Snow/ice accumulation forecast for Wednesday 2/6. --Far North Jersey (generally in and around Sussex County)... Periods of heavy snow and/or wintry mix could lead to significant travel issues. While there could be a transition to rain at some point, it's a mostly wintry forecast. 3 to 7 inches of snow and a glaze of ice are expected. --The rest of North Jersey (generally north of I-78)... Wintry mix arrives Wednesday morning, changing to rain sometime in the afternoon. Another quick hit of snow is possible (but not guaranteed) Wednesday night, depending on when the precipitation ends. So the day will feature a mix of both wet and wintry weather, and road conditions could become pretty treacherous. Snow accumulation of an inch or two and a glaze of ice accumulation (a few tenths of an inch) are expected. --North-Central Jersey (generally between I-78 and I-195)... A quick hit of wintry mix will be followed by a transition to rain around midday. Another quick hit of snow is possible (but not guaranteed) Wednesday night, depending on when the precipitation ends. It will be a mostly wet day, but some icing is possible. Snow accumulation of a coating to an inch and a trace of ice accumulation are possible. 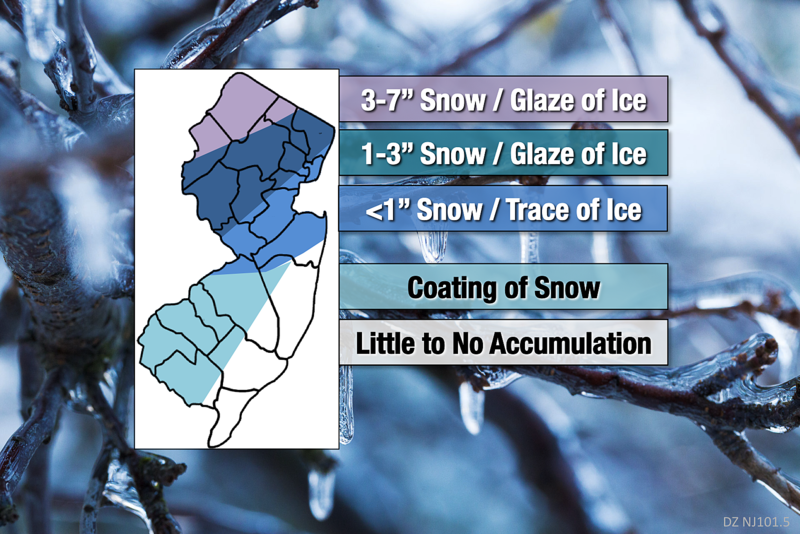 --Inland South Jersey (generally along the I-295 corridor)... Almost all rain, although there could be a bit of wintry mix early Wednesday and an additional quick hit of snow Wednesday night. Travel issues should be minor, with only a coating of snow in the forecast. --Coastal New Jersey... Almost all rain, with just some snowflakes mixed in early and late Thursday. Little to no accumulation is anticipated. Watches, warnings, and advisories from the National Weather Service as of Tuesday morning. Teal=Winter Storm Watch. A Winter Storm Watch has been issued for Sussex and western Passaic counties from Wednesday morning through Wednesday night, as snow and ice accumulations may significantly impede travel for most of the day. If the current forecast holds, the watch will be upgraded to a warning around Tuesday afternoon. We'll almost certainly see an advisory posted for the northern half of the state at that time too. There could be residual icing issues Thursday morning as another blast of colder air arrives in the Garden State. As skies become mostly sunny Thursday, high temperatures will be limited to the lower to mid 30s — decidedly below-normal for early February. A brisk breeze up to 20 mph will add an extra bite to the cold. On Friday, a sagging front may clip northern New Jersey with scattered snow showers. I'm thinking most of the state will stay dry and quiet on Friday, with moderating temperatures climbing to the lower to mid 40s. The warming trend takes us into the upcoming weekend too, with more 40s on Saturday and some 50s on Sunday. Clouds will win the sky throughout the weekend, with periods of rain in the forecast for Sunday.